Have you lost or deleted your precious photos or videos from the CF card that you must get back? Platinum Data Recovery has a solution for all your data recovery needs. We have the right equipment, experience to recover your photos. Our expert engineers have the knowledge to successfully recover your data from damaged or corrupted CF cards. For more than 15 years, we have saved countless digital photos and videos from tens of thousands of CF cards sent by professional photographers, camera shops, individuals as well as video production businesses. No matter how you’ve lost your data, Platinum Data Recovery is well-known in the data recovery industry for recovering all your lost data. We are even trusted and recommended by major camera and memory card manufacturers for our outstanding services. We restore thousands of images and other files each day which gives you a guarantee that your data is in safe hands. A Compact Flash card (CF card) is a memory card format developed by SanDisk in 1994 that uses flash memory technology to store data on a very small portable device. A flash is a non-volatile form of memory, which helps store data on a device to retain. The cards are based on the Parallel Advanced Technology Attachment (PATA) interface, with the dimension of 42.8 mm by 36.4 mm (about the size of a matchbook) and are available with storage capacities ranging up to 512 gigabytes (GB). The CF (Compact Flash) cards are bifurcated into two based on their thickness, to accommodate different capacities of storage. The type I CF cards are of thickness 3.3mm and Type II CF cards come in a thickness of 5.0 mm. A CF card features solid-state construction, which makes it much more rugged than most traditional storage devices. Originally CompactFlash was built using Intel’s NOR-based flash memory, but later it adopted NAND technology which is better suited for large amounts of data storage. The speed calculation method is similar to CD-ROM and each card has an embedded speed limit. Normally, standard speed is up to 150 kbps. CF cards are primarily used as removable memory for higher-end digital photo and video cameras. In 2008, its new variant CFast was announced. The latest CompactFast is based on the Serial ATA interface which provides better transfer rate as compared to the traditional variant. Compact flash cards are a bold innovation by SanDisk and are widely being useful in an array of different applications. They are as reliable as any other flash-based storage media and offers great flexibility. However, like any flash-based storage card, a CF card is subject to some basic limitations. 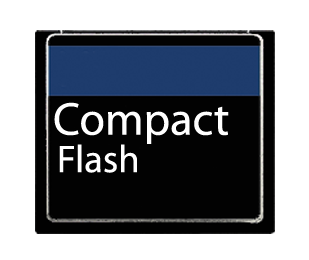 CompactFlash cards have a limited overall lifetime which disables them to be utilized for years and years. Even the top manufacturers of this product recommend utilizing the card for only 2 years in a row. Though CF cards are physically reliable, they can be susceptible to many logical problems. Corrupted files may develop when they are removed too early when photos are taken too quickly and even when the camera battery is low and not providing reliable power to allow the card to write. Occasionally physical damage can also occur with exposure to contaminants, water submersion, and improper insertion. CF Cards are not to be confused with MicroDrives of the same size, which use magnetic media as opposed to flash. The upside to using CF cards as opposed to other flash media devices is that they are thicker than others, which could help prevent breakage or physical damage. Unfortunately, this also limits the devices they are compatible with, as manufacturers work to make products thinner and lighter. CF (Compact Flash) cards are used primarily in portable electronic devices such as digital cameras and video recorders. Whether you’ve accidentally deleted photos or your files got corrupted due to any reason, in most cases we can recover your lost data from a CF Card. We have skilled engineers and advanced recovery hardware which in some cases enable us to recover your files without having to disassemble your card. Typically, CF cards fail due to two reason- physical damage or logical failure. We, at Platinum Data Recovery, make sure to recover your lost data in any such condition. One of the most common physical failures is damaged or corrupted controller chip. About 80% of the cards we receive with physical damages have a controller chip problem. When your CF card suffers any physical failure, call us for immediate assistance. Maybe you were not careful enough and you deleted photos from CF card by mistake. Or chances are you’ve unintentionally formatted the CF card due to careless operation. Another possibility is you moved your CF card when operations were still running and that resulted in data loss. Even sometimes unexpected occurrences like power failure may lead to data loss. How to improve the chances of recovery? If a CF card has shown a corrupted image or file, or cannot be accessed in the camera or on the computer, do not format the card if you still want to retrieve the data. Discontinue use and call us immediately. Formatting can make the recovery process significantly more difficult, and you don’t want to lose your chance to recover your files. It’s recommended to not take more pictures on the same memory card before the recovery process to avoid the possibility of overwriting. Why Choose Us for CF Card Recovery? We recover data from CF cards daily and understand that the pictures and videos you take are precious to you. Our engineers have at their disposal the latest equipment and software needed to retrieve your data safely and securely. We offer comprehensive recovery services and have the highest success rate in the industry. Don’t put your data at risk! Call Platinum Data Recovery today!